Bangor Grammarians have been contacted by Year of 2014 past pupil Robert (Rob) Will, who is currently studying for a PhD in Clinical Biochemistry at Cambridge. He is on the organising committee of a summit and action plan at the university called Shaping Horizons, revolving around science, policy and innovation across the UK and Latin America. The age range is 18-33, so it will only be applicable to some of the Upper Sixth in school, but Rob believes there are some really impressive people both there and among the Grammarians. On behalf of the Shaping Horizons Committee, I would like to invite students, alumni, post docs and researchers to apply for a chance to become a Future Leader in the Shaping Horizons 2019 Summit and Action Programme. We believe there are many aspiring and promising leaders in Northern Ireland, who we think would be interested in joining us. I therefore hope and would appreciate if you could distribute the information below among the young leaders in your organisation. We look forward to having an inclusive and representative selection at our summit in September 2019. Are you a young leader from the UK hoping to use science, policy and innovation to drive change? We are now selecting the most promising young leaders to become Future Leaders and attend Shaping Horizons taking place at the University of Cambridge. Shaping Horizons will gather 150 young leaders from across the UK and Latin America to engage with senior world leaders and discuss common challenges faced by both regions. Some of our featured speakers are: Prof. Thomas Lovejoy (Godfather of Biodiversity, United Nations), Prof Sir. David King (former Chief Scientific Advisor, UK), Prof. Dame Henrietta Moore (Director, Institute for Global Prosperity), John Bramwell (Director of Education, British Council). Future Leaders will also help to create evidence-based policy reports for governments on issues covered during the summit. Furthermore, Future Leaders sharing similar interests will work in groups in order to design and pitch a project related to a particular theme of the summit, feasible enough to be implemented by the Future Leaders in both regions, under mentorship of Cambridge academics and Shaping Horizons partners. 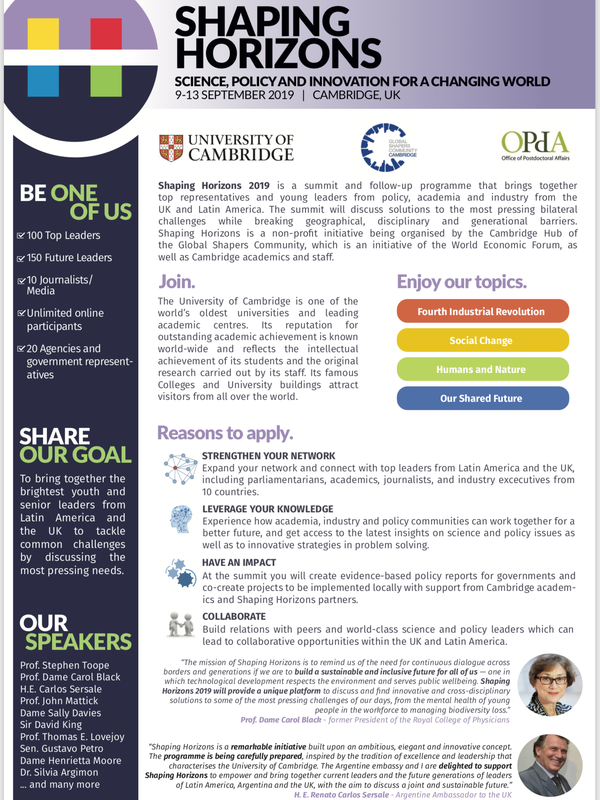 Finally, Future Leaders will become part of a bilateral network of leaders tackling some of the most pressing problems faced by the UK and Latin America. Applications will run between March 31st and April 14th. Please see link below to start your application!